At Lakeland Scottish we believe that nutrition should not be blind to the reality of cow performance in the real world. We like to get our boots dirty and find out exactly what is going on in the herd before we start formulation work. The Blueprints that we have included in this section outline a more detailed approach to the nutrition management of modern dairy cows and young-stock. All of the blueprints are works in progress. We continually revise and update these documents as well proven research improves our outcomes. 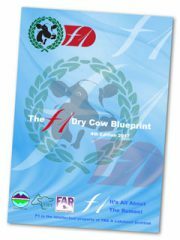 The F1 Dairy Blueprint has been designed to explain in fairly non-scientific language a rational system for feeding modern dairy cows. We recognise that just about every farmer has their own preference and approach to feeding the cow. The F1 Dairy Blueprint is designed to be flexible and can be adapted to suit just about everyone. This is an excerpt from the main F1 Dairy Blueprint. We feel this area of management is central to ensuring the success of the dairy cow in achieving a trouble-free and productive lactation. It is the foundation needed to make sure that the cow gets off to a good start. Attention to detail at this stage can pay some large dividends and the blueprint outlines some successful techniques. There has been an enormous amount of progress made recently with regards to ensuring that the dairy calf gets off to a great start in life. This blueprint looks at the techniques required to successfully rear a healthy dairy heifer which will calve ideally at around 23 months.